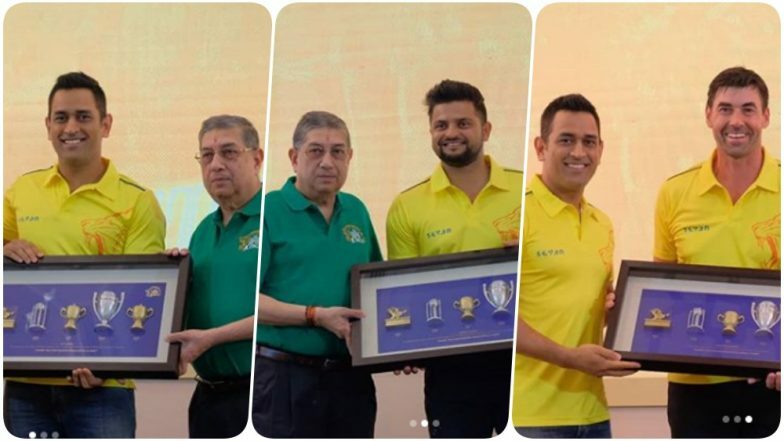 Team Chennai Super Kings felicitated MS Dhoni, Suresh Raina and Stephen Fleming ahead of the opening game against Royal Challengers Bangalore tomorrow at Chepauk. The three players are known to have served the team for the longest time. MS Dhoni was the first member to be bought by the Chennai Super Kings in 2008. Even Raina has stayed with the team ever since 2008. New Zealand’s Stephen Fleming, played for the franchise in the first edition of the IPL as an opener and then joined the team as a coach. Chennai Super Kings to Donate the Proceedings From the Match Against RCB to the Martyrs of Pulwama Attack. The team has won three IPL trophies with these three players in the squad. It was last year after the team made a comeback from a hiatus of a couple of years due to spot-fixing, team CSK won the trophy and gave an ideal gift to the fans. The pictures of the felicitation were shared by the official page of the Yellow Army. N Srinivasan, the Director of India Cements, who also owns CSK felicitated Dhoni, Raina and Fleming. Check out the full schedule of the IPL here. Here are a few other pictures of the reunion. Even the support staff of the team were felicitated. The team also welcomes Faf Du Plessis ahead of the first game. The team will play the opening game tomorrow at 8.00 pm. The management of the Chennai Super Kings has decided that the team will donate the earnings from the first match to the martyrs of the Pulwama attack. CSK skipper MS Dhoni will present the cheque to the families.